Tuscarora is a sovereign nation in the Niagara region of Upstate New York and a member of the Haudenosaunee Confederacy. The Tuscarora were the first native people to be dispossessed of their land during the colonization of the United States. The certainty of their future was at stake as they walked north, beginning in 1713, to join their Haudenosaunee relatives. Now, almost 300 years after this hardship, they are prospering as a people. 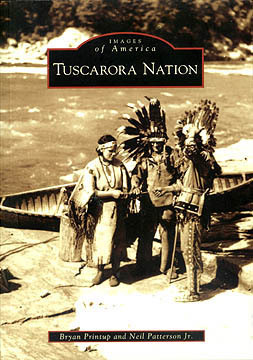 Tuscarora Nation depicts their culture and traditions, the height of their agricultural success, the rich heritage of lacrosse, the unique fishing culture along the Niagara River, and their traditional government of chiefs and clanmothers. Residents Bryan Printup, Beaver Clan, and Neil Patterson Jr., Bear Clan, were raised in the Tuscarora Nation. They work for the Haudenosaunee Environmental Task Force, utilizing oral history as an innovative approach to environmental protection and restoration. For Tuscarora Nation they unearthed rarely seen and touching photographs from a variety of museums, libraries, and local collections. The most significant contributions came from Tuscarora family albums, making this a truly homegrown story.